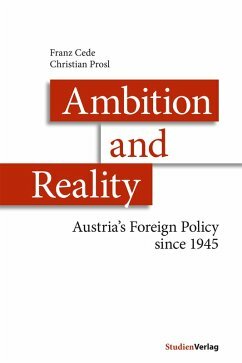 The authors' analysis sheds light on Austria's foreign policy after the Second World war and offers insights into recent developments based on many years of experience in the diplomatic service.This book describes the most important issues of the Second Republic's foreign policy in a succinct yet captivating way and provides insight into diplomatic practice. It is aimed at readers who are interested in international issues in general and Austrian foreign policy in particular and offers a highly informative and thoroughly readable overview of the developments of the past decades - from the re-establishment of the Foreign Service and Austria's role in the Cold War to the changes that have taken place since Austria's accession to the EU. The book sheds light on Austria's relations with her direct neighbouring states, the ambivalent relationship with the USA and the effects of the collapse of the USSR.The authors have written this book based on many years of experience in the diplomatic service. With their analysis they aim to contribute to a better understanding of Austria's position in an international context. They do not just direct their gaze into the past but also into the present and future of Austria's foreign policy. Above all they take into account the fundamental changes that took place at the beginning of the 21st century - changes that have brought totally new challenges for Austria. Ambassador Franz Cede was admitted to the Austrian Foreign Ministry in 1972. In his diplomatic career Cede first worked at the Austrian embassies in Paris and Rabat. He was later appointed ambassador to Zaire (Congo), Consul General in Los Angeles, ambassador to Russia and in Brussels where he was Austrian ambassador to Belgium and to NATO. In Vienna, Ambassador Cede was assigned to the International Law Office of the Foreign Ministry. He was Director of the International Law Office from 1993 to 1999. Ambassador Cede is the author and editor of numerous publications in the fields of international law, European law and international relations. He taught at the Diplomatic Academy in Vienna and the Andrássy University in Budapest and is presently teaching at Webster University in Vienna.Ambassador Christian Prosl worked with the UN Development Program (UNDP) in Burkina Faso and Rwanda from 1973 to 1977. In 1977 he joined the Foreign Ministry and was assigned to the embassies in London and Washington, followed by an assignment as Head of the Secretary General's Coordination Office in the Foreign Ministry in Vienna. From 1991 to 1995 he served as Consul General in Los Angeles. Back in Vienna, he was appointed Head of the Department for Western and Northern Europe and acted as Head of the Legal and Consular Section from 1998 to 2002. From 2003 to 2009 he served as Austrian ambassador in Berlin, followed by an assignment as ambassador to the US until 2011. He retired in December 2011. Since 2012 he has been the president of the Austrian Cultural Association.